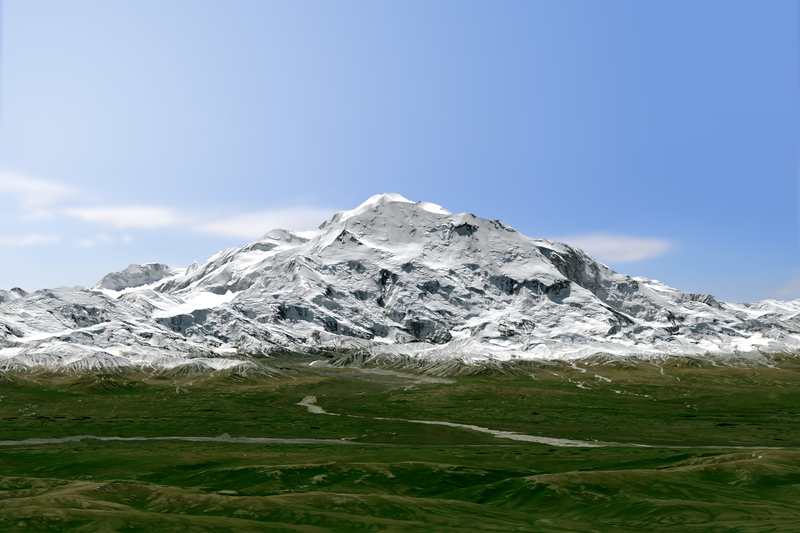 Physically, not too much has changed on Denali, North America’s highest peak. What did change in 2015 is how people describe and measure Alaska’s majestic mountain. On August 30, 2015, U.S. Secretary of the Interior Sally Jewell announced that the mountain’s official name would be Denali, not Mount McKinley. Restoration of the traditional Koyukon Athabascan name of Denali, which means “the tall one,” resolved a request by former Alaska Gov. Jay Hammond that dates back to 1975. But the mountain’s name was not the only change. On September 2, its elevation was also revised. The U.S. Geological Survey announced that Denali’s summit had a new, official elevation of 20,310 feet (6,190 meters)—10 feet shorter than surveyors had determined in the 1950s. The mountain has not shrunk. Instead, technology has improved. The images on this page offer two views of Denali as observed on June 15, 2015, by the Operational Land Imager (OLI) on Landsat 8. 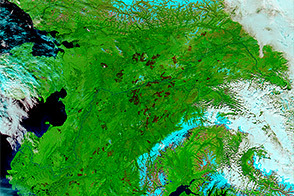 The natural-color Landsat 8 images were draped over an ASTER-derived Global Digital Elevation Model, which helps show the topography of the area. 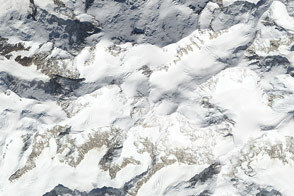 Denali’s two major summits are visible in the images. 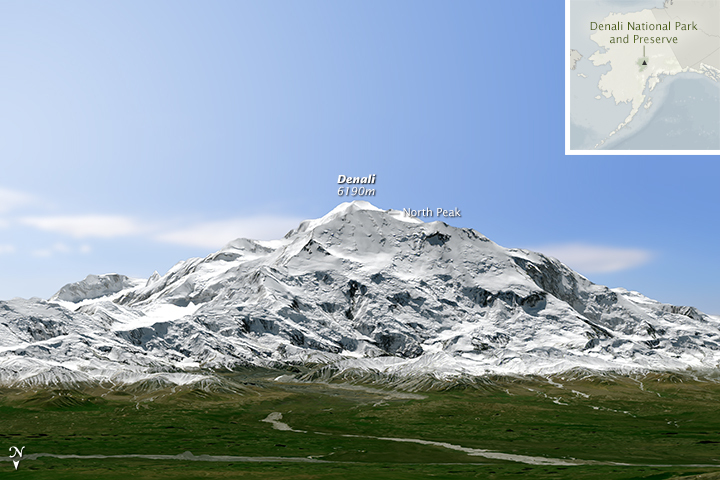 The south peak is the higher of the two, and was the focus of the new survey supported by USGS, NOAA’s National Geodetic Survey, and the University of Alaska, Fairbanks. 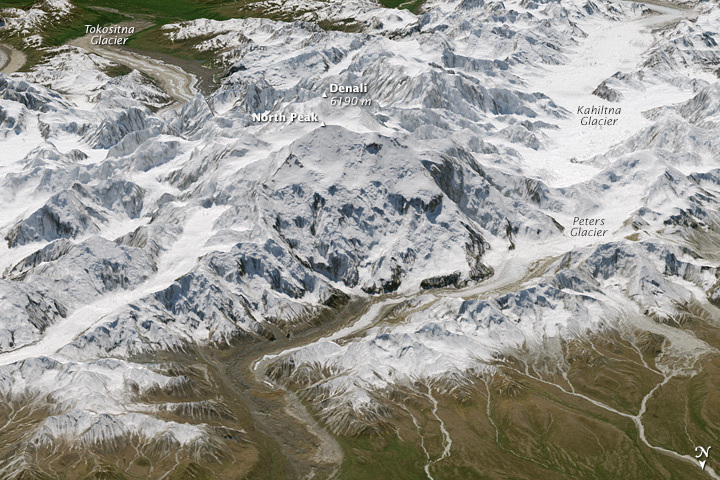 Surveyors flew from Talkeetna Airport, near the entrance of Denali National Park, onto the Kahiltna Glacier, visible just west of the peak in the bottom image. 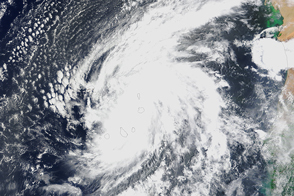 (Note that north is pointed down in both images.) From there, the team of GPS experts and mountaineers began their ascent; they reached the summit in on June 24, 2015, according to a USGS feature story. The new, more precise elevation measurement was made with modern GPS survey equipment, combined with improved gravity data to better approximate the geoid (and where the elevation is determined to be zero). The scientists also had to consider variables such as the depth of the snowpack. Once the data were processed and analyzed, the new elevation that emerged was 20,310 feet (6,190 meters). That’s slightly less than the elevation reported in 1952 by surveyors who climbed the mountain: 20,320 feet (6,193 meters). Both of those numbers vary from the elevation of 20,237 feet (6,168 meters) reported in 2013. That elevation was estimated from airborne Interferometric Synthetic Aperture Radar (InSAR) data, which calculated the average height across a 269-square-foot (25-square-meter) area around the summit—not Denali’s highest point. InSAR is useful for collecting data in areas that are a challenge to map, but are not intended to provide a precise measurement from the summit. NASA Earth Observatory images by Joshua Stevens (top) and Jesse Allen (bottom), using ASTER GDEM data from NASA/GSFC/METI/ERSDAC/JAROS, and U.S./Japan ASTER Science Team, and Landsat data from the U.S. Geological Survey. Caption by Kathryn Hansen. North America’s highest peak is slightly shorter than previously thought. 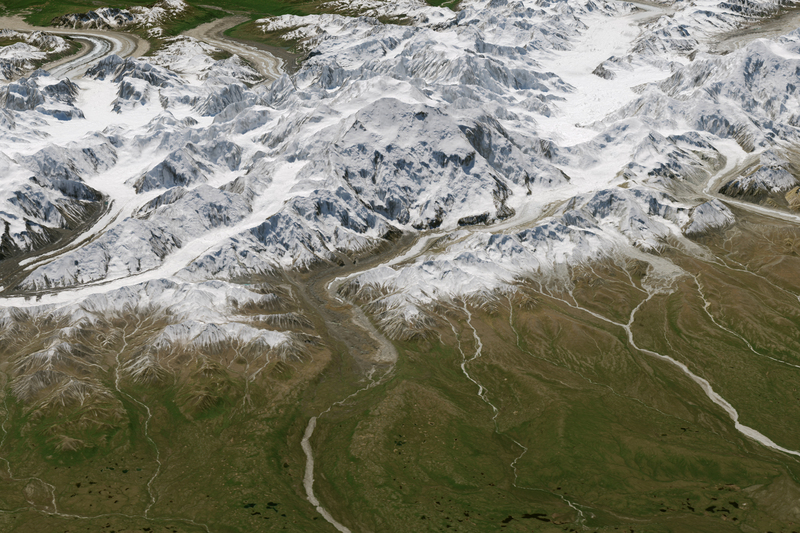 NASA Earth Observatory (2013, September 26) Same Mountain, Different Measurements. The New York Times (2015, August 30) Mount McKinley Will Again Be Called Denali. Accessed September 1, 2015. U.S. Department of the Interior (2015, August 30) Secretary Jewell Announces Nation’s Highest Peak Will Now Officially Bear Native Name. Accessed September 2, 2015. USGS Newsroom (2015, September 2) New Elevation for Nation’s Highest Peak. Accessed September 2, 2015. USGS Science Features (2015, September 2) New Elevation for Nation’s Highest Peak. Accessed September 2, 2015. USGS Science Features (2015, August 30) Old Name Officially Returns to Nation’s Highest Peak. Accessed September 1, 2015.